Komische Oper’s artistic director, Barrie Kosky, scored with a brilliant and entertaining production of Leonard Bernstein’s West Side Story and followed it up by a brand-new production of Bernstein’s lesser-known (but intriguing) operetta, Candide (seen 3 April 2019). A fast-paced piece, it centres round the question: ‘Why do bad things happen to good people?’ I have often pondered that myself! Paul Curievici was Candide, with Meechot Marrero as Cunégonde, Franz Hawlata as Voltaire/Dr Pangloss and Anne Sofie von Otter at the Old Lady. Jordan de Souza conducted. The work was performed in an edition based on John Caird's Scottish Opera version. French philosopher, Voltaire (François-Marie Arouet) created the character of Candide whom, like himself, was an illegitimate child born to a nobleman but unlike him was easily led. After Candide is found out about his illicit love-affair with Cunégonde, the less-than-noble-born Candide unceremoniously quits the place of his birth and embarks on a journey round the world inspired by Dr Pangloss’ thinking that travelling is good for the soul. Therefore, clinging to Pangloss’ philosophy and the optimism surrounding it, Candide’s worldly odyssey takes him all over the show from Bulgaria to Lisbon and from Paraguay to Venice. Along the way he encounters a string of hair-raising moments and natural disasters ranging from war to earthquakes and slavery to prostitution. But driven by an invincible optimism, nothing brings him to stray from his belief in the good and love for Cunégonde. Finally, after countless global adventures, he’s reunited with her. First appearing on the Broadway stage in 1953, Candide raised a few prurient eye-brows as to its content. The production featured Max Adrian (Voltaire/Dr Pangloss), Robert Rounseville (Candide) and Barbara Cook (Cunégonde). A box-office disaster, the show folded after 73 performances with the libretto being considered too serious by the critic of the New York Times. How times have changed! The first London production was seen at the Saville Theatre, Shaftesbury Avenue, in 1959, following out-of-town previews at the New Theatre Oxford and Manchester Opera House. The cast included Laurence Naismith (Voltaire/Dr Pangloss), Denis Quilley (Candide) and Mary Costa (Cunégonde). The National Theatre mounted a further London production in 1999 with Simon Russell Beale (Voltaire/Dr Pangloss), Daniel Evans (Candide) and Alex Kelly (Cunégonde) while the Southwark-based Menier Chocolate Factory mounted an excellent production in 2013 (which I had the pleasure of seeing) featuring James Dreyfus (Voltaire/Dr Pangloss), Fra Fee (Candide) and Scarlett Strallen (Cunégonde). Komische Oper’s production - featuring Franz Hawlata (Voltaire/Dr Pangloss), Paul Curievici (Candide) and Meechot Marrero (Cunégonde) - proved a wondrous affair and one to chalk up. Ms Marrero, for instance, was absolutely brilliant in her role and delivered the show’s most famous and telling number ‘Glitter and Be Gay’ with confirmed passion coupled with a touch of Broadway glitz while Mr Curievici’s portrayal of the pivotal role of Candide was exemplary. A tour-de-force of a role, he’s on stage for the best part of the show and delivered a thoroughly credible and entertaining performance. Mr Hawlata as Voltaire (whose first appearance on stage saw him adorned with an over-accentuated 18th-century style wig - Venice Carnival stuff!) produced the goods, too, commenting in an affable and whimsical way the ongoing action and sparkled in the role of Dr Pangloss, Candide’s fervent companion on his travels and worldly adventures. And he became the centre of attention in the famous auto-da-fé (public hanging) scene witnessing him receiving his lot (well, not quite!) whilst a very large chorus aided the hangman’s joy by gathering together in small gossiping groups to enjoy the macabre spectacle set before them. It was Spanish Inquisition stuff wrapped up in a French Revolutionary parcel! Overall, it was a well-cast show directed with great flair and imagination by Barrie Kosky who had the wisdom of casting Anne Sofie von Otter in the role of The Old Lady. She put in a fine and well-disciplined performance as did the likes of Dániel Foki as Maximilian, Maria Fiselier (Paquette) and Emil Ławecki (Cacambo). The well-loved scene of El Dorado (the lost city of gold) was well staged with an idyllic-designed set conjured up by Rebecca Ringst while Alessandro Carletti’s soft-lighting effects highlighted the myriad of golden-coloured glitter flakes raining down from the gridiron offering the scene an ethereal-looking picture of this fabled city stuffed with riches beyond the dreams of avarice. 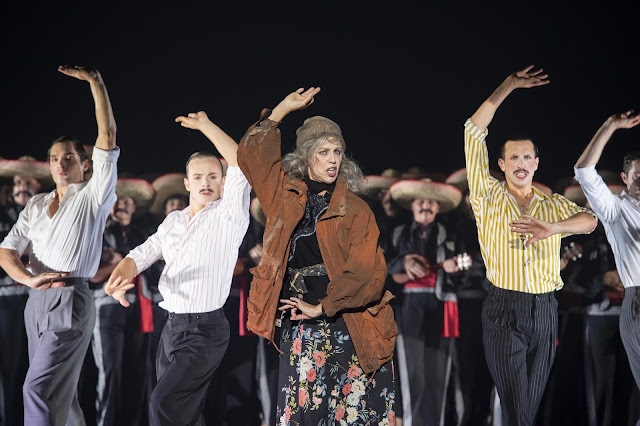 Mr Kosky’s creative team proved more than their worth in so many ways especially in relation to Klaus Bruns’ costumes who amusingly matched traditional German lederhosen for Candide in the opening scene matched by traditional 18th-century French dress for members of the chorus. A rather lovely scene unveiled itself in Venice at Carnival time with the dancers (skilfully choreographed by Otto Pichler) clad in Pierrot-style dress sporting white-painted faces, loose-fitting white costumes and traditional clown-type hats while Candide was searching for Cunégonde among the party revellers. And Dr Pangloss (who survives his execution) was seen celebrating his victory at the tables spending his money on wine, women and song, while Candide, masked for the Carnival, is accosted by Cunégonde and the Old Lady (both of whom are also masked) trying to swindle him. During the exchange, they’re unmasked and horrified and embarrassed by the result of their findings. After seeing what Cunégonde has become, Candide’s image of and belief in her is shattered and Mr Curievici’s rendering of the song ‘Nothing More Than This’ was sung so effortlessly and with deep passion in recognition of his untimely discovery. He does not speak for several days while the chorus comments in a philosophical manner that life is just life and paradise is absolutely nothing epitomised in the song ‘Universal Good’. But Candide has the last word. He really has to. Tired of his previous life, he marries and settles down with Cunégonde on a small farm outside of Venice. The show features a good ending with members of the full company singing that glorious number ‘And Make our Garden Grow’ which brought the curtain down upon a fine production that Barrie Kosky and Komische Oper should be immensely proud of. The work in the pit is, of course, as important as the work on stage and Jordan de Souza was firmly in control with the balance between pit and stage evenly matched while members of the chorus (well drilled by David Cavelius) more than made their mark in a production mounted to mark the centenary of Bernstein’s birth hitting the mark in more ways than one.